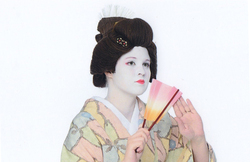 Tsuki no le Okiya was founded in 2011 to demonstrate and educate about the arts of the geisha, Japan's number one cultural symbol. Contrary to popular media's portrayal, geisha are not courtesans but highly trained performers of music, dance, and other traditional arts. Tsuki no le Okiya's members seek to honor the geisha's traditions and promote a better understanding and appreciation for these women.